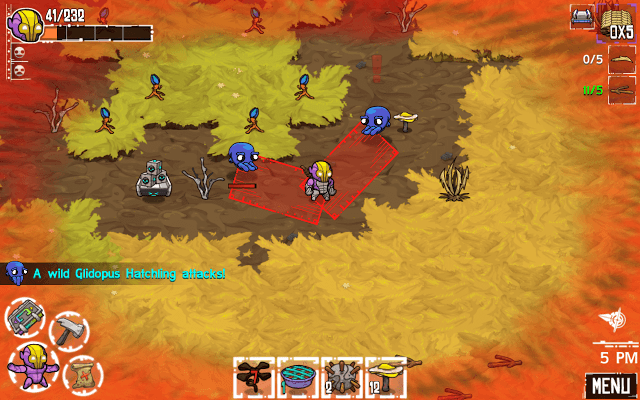 Crashlands is a survival RPG with crafting elements. The game’s developed by Butterscotch Shenanigans. Players step into the shoes of an interstellar delivery lass whose spaceship crash lands on an unknown planet. Flux Dabes needs to repair her ship, find equipment to contact the authorities and get the hell out of the planet. But before that Flux needs to survive, explore the planet and look for stuff that will help her fix her spaceship. You will have to build a shelter, craft items, help and befriend locals, unearth secrets, and fight wild beasts and strange creatures that roam around the planet. There are plenty of quests to complete, and each quest is somehow related to the main storyline. There are also side quests that grant you items that will help you in future missions. If you love Diablo and have deep fondness for Terraria, then you should play Crashlands. These quick tips, hints and strategies will help you survive, battle beasts and find key crafting materials. Creatures come in all shapes and sizes, but most of them are quite dangerous if you get too close to them. Try to avoid being in their field of view and maintain a safe distance. Stay away from large creatures if you are not fully equipped with advanced weaponry and armor. If a creature spots you, quickly move out of its way. Tap and hold the screen to go to a different direction. The game lets you know when a creature will attack. 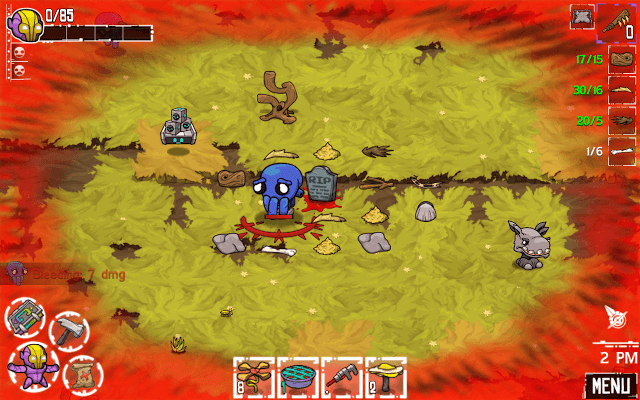 A red exclamation mark appears above a creature, indicating it’s about to charge. Also, a red path is shown on the ground, showing its attack range. The first sign gives you enough time to escape from their attacks. Make sure you get out of the red path (attack range) quickly and move to a safe spot, far away from a creature. Some creatures may follow you for a few seconds, but won’t stalk for long if you keep hopping away from them. And if you are surrounded by deadly creatures, then hit the map and poke a telepad near you to escape their wrath. 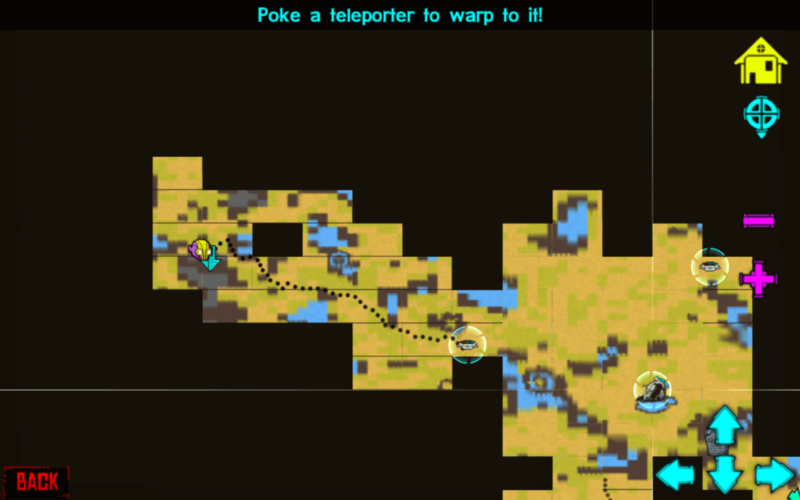 You may even teleport Flux to your main base and come back later by tapping the closest telepad. 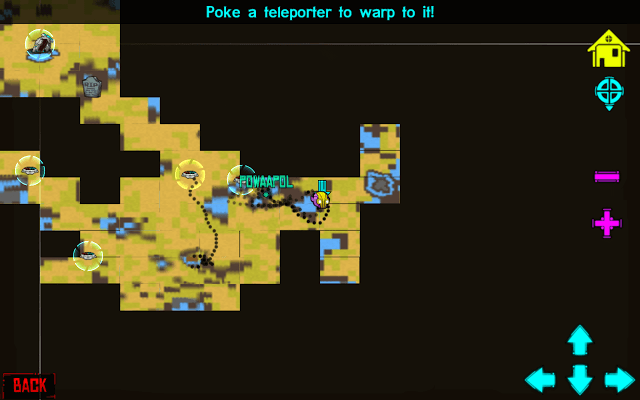 Do remember that you can’t teleport Flux while battling creatures, so make sure you keep hopping away from beasts, choose a safe spot and quickly tap on the map to teleport her to the nearest telepad. Keep exploring planet to discover new telepads. 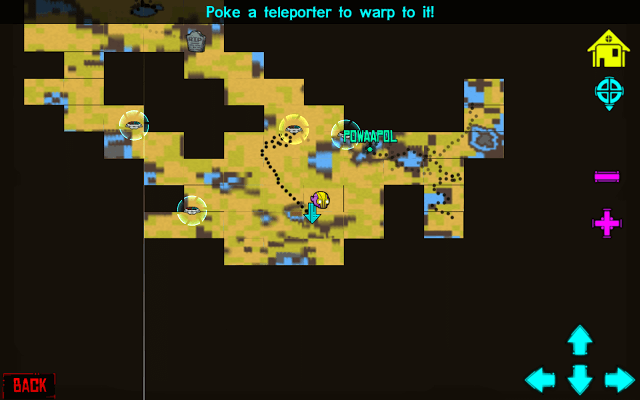 A newly discovered telepads will appear on your map. Many times a creature may appear close to a teleporter. You will have to be very quick in escaping its attack if you land on that telepad. An ill-equipped character can easily be killed by a menacing creature. Along with equipping a powerful weapon, equip the strongest helm, chest armor, gloves, leg armor to Flux if you really want to kill a creature and withstand ambush/poisonous attacks. As you complete more and more quests, you will get an opportunity to build advanced crafting stations that will let you create stronger armor and weapons. When you craft a new weapon or armor, the screen displays stats of both old and a newly crafted weapon/armor. The item comparison screen above shows how powerful the new weapon/armor is compared to the equipped weapon/armor. 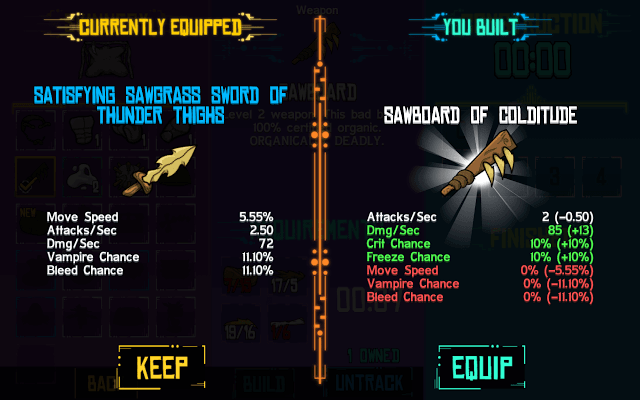 Equip the newly crafted item if you see that most of its stats are better than the equipped item. In the beginning, the Space Wrench can come very handy when it comes to stunning creatures. You may later replace it with Sticky bombs, which can stun and even kill a creature. A hit from a space wrench stuns a creature for a few seconds. If you hit a creature from a distance, it will regain consciousness by the time you go closer to it. Hence, you will have to move very close to the creature to get a chance to drain HP as much as possible before it gets back to its sense. Sneak up to a creature and move closer to it; quickly tap on the space wrench and tap the creature to knock it down. You can then hit the creature with your primary weapon and kill it. Potted Baconweed flowers respawn every 20 minutes, so you can come back after 20 minutes to collect them. There are also healing crystals scattered all around the planet. They glow when active. Tap on a healing crystal only when Flux is low on health. Healing crystals recharge over time. Just tap on an empty crystal to check how many minutes are remaining for the next charge. One healing crystal is near Powaapol. I have marked its location in the above screenshot. Another crystal can be found very close to the teleporter, near Caarta’s Station. There are also some crystals that grant “Turbo Speed” and other abilities to your character. You can create your own potted sunshrooms and baconweed and place it close to your base. To create a potted sunshroom, you will need the Stoneshaper crafting station. Collect the required sunshrooms and flatstones to craft a potted sunshroom. When traveling from one area to another, you may feel a bit lost and may have to hit the map several times to locate your current location and the destination. Things can get tougher if that area is still undiscovered and “dark”. Thankfully, there’s a way to get directions by setting a waypoint. Tap the map icon and then tap the waypoint icon (circle) which is located under the home icon at the top-left corner of the screen. Now tap on an area that you want to reach. An arrow will appear in that area. Hit the back button and you will see a compass needle pointing to the area where you placed a waypoint. The compass needle is located above “Menu”. Just follow the direction of the needle and you will reach your destination in no time without having to check the map over and over again. Building floors on the ground serve a key purpose. Creatures won’t spawn there in the future. As you progress, you will be able to upgrade your flooring by replacing current floors with sturdier ones. You can expand your house by building more floors if you want to accommodate more crafting stations and other important structures inside it. But before expanding, keep in mind that you may have to move existing furniture to a different area in your home to free up space. Once you have expanded your house by placing more floors, tap on the build menu (axe icon) and then tap on objects that you want to move to another spot in your house. The selected objects will be stored in the build menu. Later you can tap on the stored objects and then tap on an area where you want to place it. Don’t litter your house with useless furniture. Build and place those that are productive. Chairs and all don’t serve any purpose other than decorating your house. Also, once you have a new and better crafting station, you can free up some space by storing the older ones in your inventory. Hit the Build menu and then tap on those that you don’t need. Predators lurk around the planet and are likely to attack your house at night than in the morning. Try to protect your house by building walls around it. Keep all workstations and crafting stations inside the walls. Have one door on the front of the house. Make sure you tap on the door to close it when you are out exploring or inside your house. Once you build sawmill, start building wooden walls around your house when you get its schematic. As you progress, you will be able to build traps and defenses around your house for extra protection. You will also be able to build sturdier walls and doors as you get build better crafting stations. When Flux is reduced to pulp, a gravestone appears in that spot and your character respawns to the closest telepad. The gravestone stores items that Flux drops after being killed. Going near your own gravestone lets you collect those fallen items. A gravestone icon also appears on your map. Just set a waypoint to a gravestone and collect lost items. You also collect gravestones along with those materials. They can be used as walls, but that will really make your house look ugly. Bored exploring the planet in search for plants and trees? Why don’t you plant their seeds and to grow them right in your backyard, close to your house? All you need is “Furdle Dirt” and the seeds of plants/trees. Seeds are by-products and some plants/trees like the Logtree and Sawgrass drop them. Furdle Dirt can be created by combining Dirt and Sawdust. The black lump of dirt is available close to lakes. Sawdust is the byproduct of Logtree. Once you have created Furdle dirt in the BS Workstation, you are ready to plant seeds. Hit the Build button. Under the Floor icon, tap Furdle Dirt and then tap on the empty ground to place it. You can place multiple Furdle dirt to plant more seeds. After placing them, tap on the seeds (located under the infinity symbol) and then tap on the empty Furdle dirt to plant them. Plants take time to grow, so you can close the app and come back later to harvest them. Logtrees are usually found in grassy areas. Whistleroots are found closer to lakes and watery areas. Sawgrasses are found in grassy areas. To craft a weapon or item, you will need materials. You may have to uproot plants and trees or even kill some creatures before crafting any weapon or item. Before you start collecting materials for a particular weapon, armor or any other item, make sure you hit the “Track” button that appears beside the “Build” button. Tracking ensure you collect the right materials and don’t just keep wandering collecting random stuff. You will have to be inside a workstation to find the Track button. After tapping the Track button, a recipe list will appear at the top-right corner of the game screen. This recipe tracker tracks the materials you have collected so far. When you have collected the required number, the tracker turns green for that material. Collect Everything that comes your way. 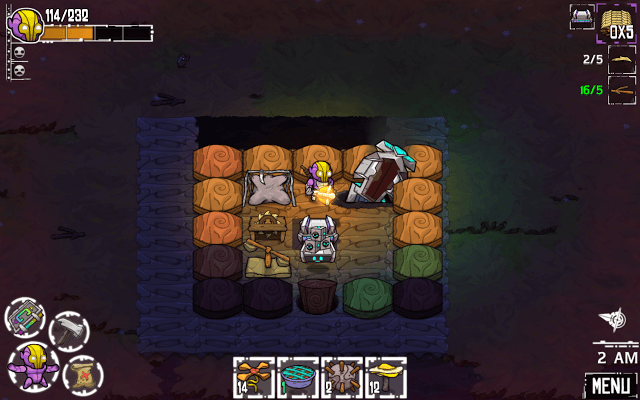 One great aspect of Crashlands is that there’s no inventory storage limit, so keep collecting items, especially those that are hard to find. You may never know when you will need them. Some plants or mysterious objects require special equipment to get them. The book contains quest details and information about creatures and plants that have been revealed in a quest.